Since we are in the middle of getting our house ready to sell, we had to bring some stuff up to our place on Cortes Island. We drove up yesterday afternoon after Liz had her retirement party with her mentor group. We arrived in Campbell River at 3:50pm in good time for the 4:30 ferry to Quadra Island and the 5:05 from Quadra to Cortes. 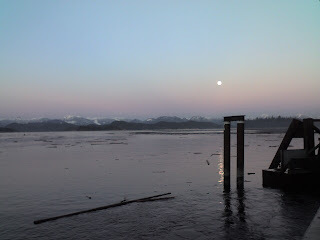 Leaving on the Cortes ferry the moon was coming up and we took all kinds of pictures, this one is with my phone and not a very good quality. Once we are back home and have the usb cables for our cameras we'll post some of the good ones. Today was a wonderful day up here with mostly sunny weather. We unloaded the van and empty out a bunch of boxes. Then went for a one hour walk on the beach. Liz and Anders First Blog.